Real Madrid goalkeeper Iker Casillas, was born in Madrid, Spain, on May 20, 1981 (28 years) and has become a major Madrid goalkeeper since 1999 replacing senior goalkeeper from Germany, Bodo Illgner. 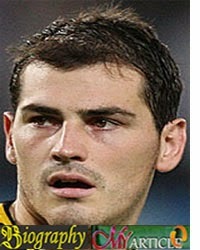 In the Champions League final in 2000, Casillas became the youngest goalkeeper in the final of the championship among the most prestigious clubs in the Blue Continent. When Real Madrid's 3-0 win over Valencia, Casillas was 19 years old. Real Madrid Casillas role in getting irreplaceable when in February 2008 signed a long-term contract until 2017 with a buyout clause worth 128 million pounds. Spanish Super Cup: 2001, 2003, 2008.